In the photo above, north is to the right and east is up. This nebula are located in the constellation of Cygnus, about 5 degrees east of Deneb. The North American Nebula is a very large area of emission nebulosity with a maximum extension of 3 degrees. It was discovered in the early 1890s by Max Wolf in Heidelberg on the first "modern" long-exposure, wide-field photographs of the region. It is easier to photograph than to see well, although with large binoculars or low-power rich-field telescopes the "continental" shape can be traced out reasonably well, especially the "Gulf of Mexico". The Gulf of Mexico area is formed by a dark absorption cloud designated LDN 935 which is part of the whole North American and Pelican Nebula Complex. NGC 7000 - North American Nebula - Gulf of Mexico Region in narrow-band filters, natural colors, which this image is part of. The North American Nebula should be visible to the naked eye in a transparent night as slightly brighter area in the Milkyway near the star Deneb, if you know exactly where it is located. A 7x50 pair of binoculars is all it takes to identify it securely, but you need to know what to expect if you are looking for it. An UHC or OIII filter hand-held between eye and eyepiece of the binoculars helps to suppress skyglow and improves contrast between nebula and background. This is an object for rich-field telescopes (RFTs). With very low magnifications of about 20x and maximum exit pupils of about 6mm the nebula will fit into the whole field of view in a 2" eyepiece in one of these. Depending on the brightness of the sky background an UHC or OIII filter might improve the visibility of this object. If you want to see detail, more magnification of about 40x and an exit pupil of about 4mm is recommended (exit pupil is more important than aperture size when viewing extended nebulae). With this magnification the outline of the nebula is easily traceable. Contrast is especially high in the "Gulf of Mexico" region of the Nebula; the Florida peninsula and the East Coast as well as dark intrusions into the nebula from the north are also worth seeking out. Immediately west of NGC 7000, in mid-Atlantic, so to speak, the Pelican Nebula, IC 5067-70, is located. It is smaller and less bright than the North American Nebula. A magnification of about 40x is a good choice, and an UHC or OIII filter is recommended (in small scopes only an UHC can be used, with an OIII the image becomes to dark) although in nights of superb transparency the nebula is also visible without filter in a 6" scope. 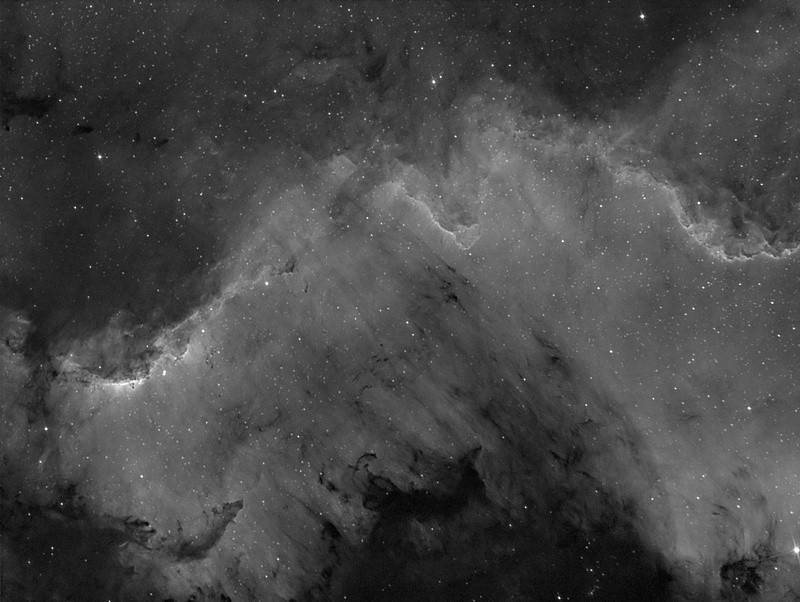 Under dark skies an astonishing amount of structure can be found in the Pelican, including the beak, the dark intrusion between beak and body of the animal, the bonnet and the irregular outline of the nebula to the south. Small telescopes (smaller than 4") might not show the nebula at all and big ones (greater than 8") offer only a small field of view, making it possible to get lost in this area. But the views of both nebulae in big telescopes closely resemble photographs of the region. The dark nebula separating the North America and Pelican Nebulae is LDN 935. It is responsible for the sharp nebula edges and good contrast in the Florida/Gulf of Mexico regions of NGC 7000. To the south of NGC 7000 and IC 5067-70 there are other patches of nebula, the brightest one is IC 5068, they are visible in moderate sized (6") telescopes but do not show much structure. The successful observation of nebulae is a skill to be learned. A beginner will not be able to see the faint structure which is readily visible to the experienced observer, as the eye has to be trained and you have to learn what to look for.